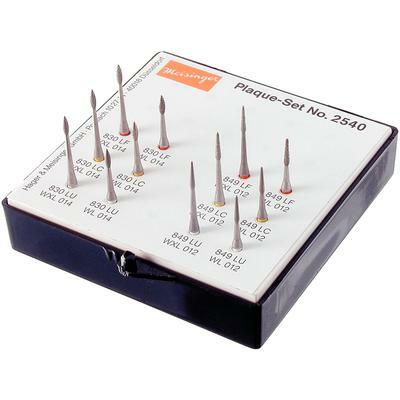 The Plaque Set is for removing residual plaque from subgingival areas and for treating teeth with two or three roots and severe bone recession that cannot be reached with a curette or scaler. Inaccessible areas should be extended with red ring diamonds while deposits and calculus should be removed from the root surface with yellow ring diamonds. For the best smoothing of root surfaces the white ring diamonds should be used. Minimally invasive root surface treatment (when treating periodontitis) can also be achieved utilizing this set. Meisinger diamond instruments consist of a shank and a hardened stainless steel body coated by the most modern galvanization process, with selected diamond grains. This guarantees an extremely homogenous, safe and lasting diamond coating of the instruments for optimal working results. All sets were designed and tested by practitioners and leading scientists for a wide range of applications in practice and in the laboratory.